compound self protected by a glass fibre and a reinforced aluminium film. The glass fibre and polyester reinforcement provides excellent resistance to puncture and the effects of work site foot traffic. The polyester coating on the aluminium top surface not only provides protection from alkalis that may be present in concrete and screeds but also provides a surface on to which most polyurethane adhesives will adhere. The high tensile strength and puncture resistance of AluBase XL makes it suitable for use over profiled metal decking where resistance to worksite traffic is essential in order to maintain integrity of the vapour barrier. AluBase XL provides a fast and easy means of waterproofing a roof structure prior to the installation of insulation and waterproofing whilst also providing an effective vapour barrier without the need for hot works or naked flame in its application. Prior to installation, surfaces must be dry, clean, smooth and free of impurities. If the surface is porous, apply a coat of Radmat Red Primer as per instructions. The use of Primer where application is to new, clean and oil free metal is generally not required. A wrong use of primer can influence the membrane efficiency. To achieve the best result, proceed as follows: always start by laying the rolls from the lowest point and work upwards, being careful not to create counter-gradient overlaps. After installation, press the membrane well by hand, heavy broom or roller being very careful not to trap air pockets. 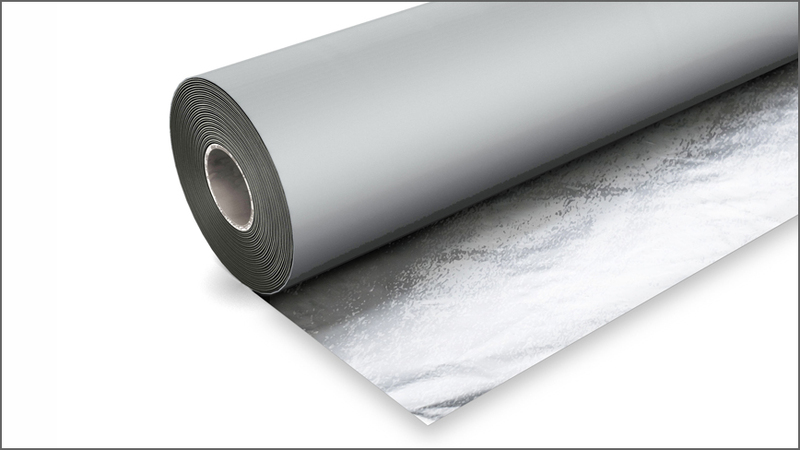 This membrane features an outer polyester film and cannot therefore be exposed directly to the sun for prolonged periods.